Produced by Brave New World, The Coffee with the Principal Series is part of Shyan Selah’s Cafe Noir Project, a multi-media, live music community outreach event series held at middle schools, high schools, colleges, live music venues, and Starbucks locations nationwide. A core principal of The Cafe Noir Project is to fuse education with entertainment in order to inspire and motivate students. Part of what sets Cafe Noir a part from other entertainment programs is the high focus we put on education. In doing so, Coffee with the Principal teams up with schools to honor students who excel or who are growing in Reading skills. Coffee with the Principal was created to bring some of these students Shyan entertains on campus off-campus, into his world, and give them a stage to showcase achievements, such as reading, by doing a live book report on a book of their choice. 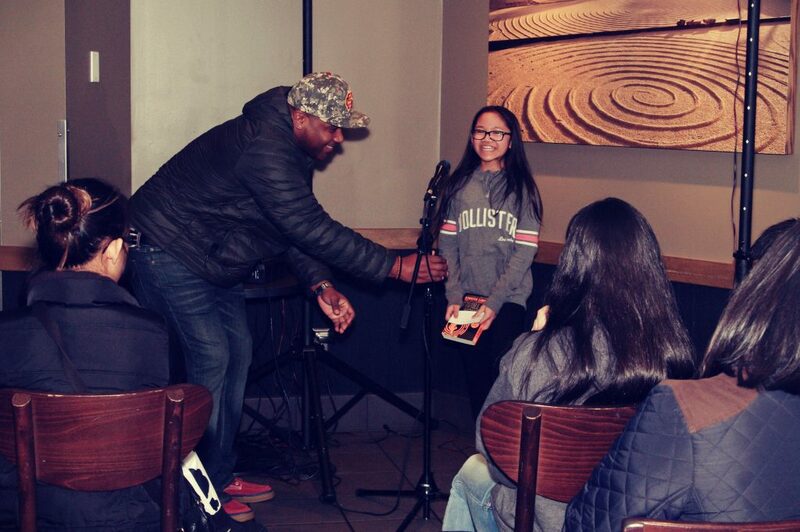 This monthly event first took place at the Dash Point Starbucks, which is also home to the Cafe Noir Project live at Starbucks, and was designed to bring the top school administration together with parents, students, and others in the community to celebrate students’ achievements in a warm, community setting. Together with the Principals, Shyan’s company, Brave New World, and The Selah Foundation works with each school’s Communities in Schools representative who select the chosen student scholars each month. During Coffee with the Principal each student gets the chance to discuss what they’re currently reading, what they enjoy about reading, and what they’ve learned from reading, while also learning how to interact with others in a social setting. As a result, the Coffee with the Principal series has become a key educational program from Shyan Selah’s Cafe Noir Project. This year we are continuing the series with our new community partner Barnes & Noble. Most recently Shyan Selah was featured in the Federal Way Mirror Newspaper regarding the growth of the Coffee with the Principal program. Click here for the story. Check out Coffee with the Principal featuring students from Illahee Middle School in Federal Way, WA. For more information about Coffee with the Principal, visit The Selah Foundation.